My husband captured this sweet moment candidly. We were on the full train, there’s no empty seat for them. The father knew how to cheer up his kids. He brought gadget tools; so the kids can play. It’s a nice way to avoid boring times! Though they must sit on the floor, they still can enjoy the train ride. Would you come and see my Ruby Tuesday ? Have a lovely evening! 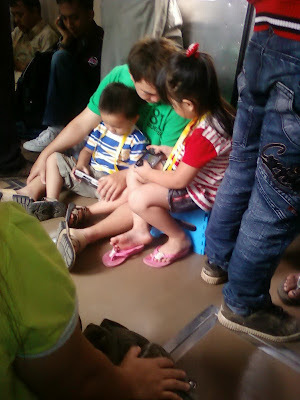 What a sweet moment of father and kids! what a smart and attentive parent! we can't just tell kids to sit tight and be quiet, right? Train rides can be long and boring without games to play! Will put big, bold thoughts in your head. And cardinal and carmine—‘nuff said!